I know, I know, so many posts! And these colors AGAIN!!! I made this bag out of a lunch sack. I just chopped off the top, put on a front, back, and handles, and voila! 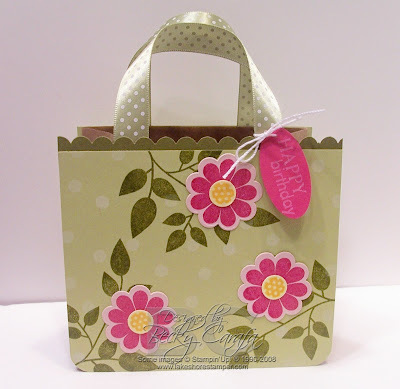 This is my entry for a chance to win a $100 gift certificate and cute little bag from Papertrey Ink. They are celebrating their 2nd anniversary. This is adorable! Love the colors and the ribbon handle! Becky, this is beautiful!! I LOVE the colors...you can never do to much pinks and greens! just gorgeous! love these little bags, they are so easy! good luck! if I don't win, I would love for it to be one of my friends! Very pretty Becky! I love the matching ribbon handles. Love the design you created! Very pretty bag! This is darling ... good luck on winning!! You'd have my vote, that is IF I could vote!! This is darling, Becky!! Oh my goodness, I LOVE this!!! Beautiful! Makes me long for spring! This is such at great idea! I love the color combo and the beautiful flowers! Pink Cat Studio Release Day!